Toshiba is announcing today that Dell will begin offering Toshiba HK4 series enterprise SATA SSDs as a storage option for Dell's PowerEdge servers. Dell currently offers a wide range of SATA and SAS SSD options and a few NVMe options. Samsung, Intel, Hitachi and Toshiba are the current SSD suppliers, but from Toshiba only the PX04 and PX05 SAS SSDs have been available in PowerEdge servers. 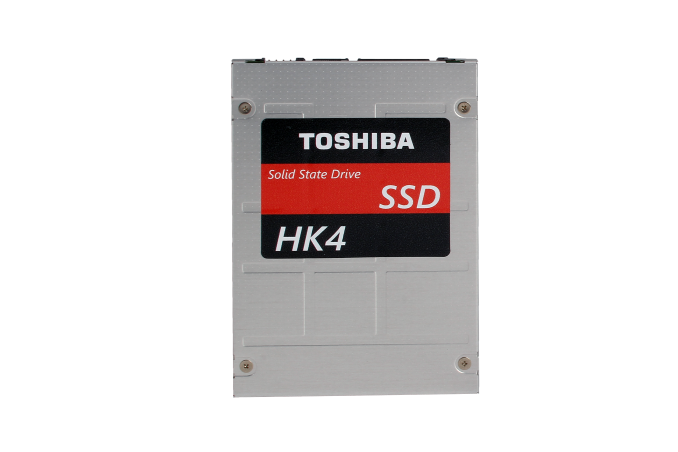 Toshiba's HK4 series stands out as the first self-encrypting drive (SED) model of SATA SSD Dell is offering in their servers. The HK4 series is available in 1 DWPD or 3 DWPD endurance tiers with capacities ranging from 120GB to 2TB and using Toshiba's 15nm MLC NAND flash. Dell will be offering the Toshiba HK4 series SSDs in both 2.5" and 1.8" form factors. The latter form factor is almost unheard of in the client space but still has a niche in the enterprise space: a 1U server like the Dell PowerEdge R630 can support up to 24 1.8" SATA SSDs. The Toshiba HK4 series has not previously been sold in a 1.8" version. Toshiba's HK4 series is not new and has actually been on the market for over a year. Aside from the self-encrypting drive option, the HK4 series does not offer any features that have not already been available for PowerEdge servers using SSDs from competing vendors, and pricing through Dell has not been announced so it's hard to say how attractive the non-SED models will be. However, qualifying the HK4 series with the #2 server vendor should help Toshiba continue the strong growth of their SSD business. (IDC's rankings from February put Toshiba as the fourth-largest SSD vendor but the fastest growing, with SSD revenue more than doubling last year.) Perhaps more importantly, this partnership sets the stage for a much quicker qualification and availability when Toshiba's next generation of enterprise SSDs launches later this year based on their 64-layer BiCS3 3D NAND. Toshiba's earlier 3D NAND generations have had minimal impact on the SSD market, but by shipping 64-layer 3D NAND SSDs this year Toshiba has the chance to catch up to Samsung, Intel and Micron in the 3D NAND transition.